Sometimes I wonder why we can’t have nice things? And when I say nice things, I say decent Marvel video games. 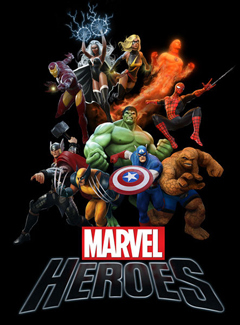 I know that many out there might let out a collective “gasp” when I would decry the shape of decent video games based on Marvel properties, but I can honestly say in the last 10 years or so, there haven’t been a ton that have grabbed me by the po po and didn’t let go. And it’s not like I haven’t played some games and wished upon wishes that I could have enjoyed thoroughly. One of those games was the now defunked MMORPG, Marvel Heroes. 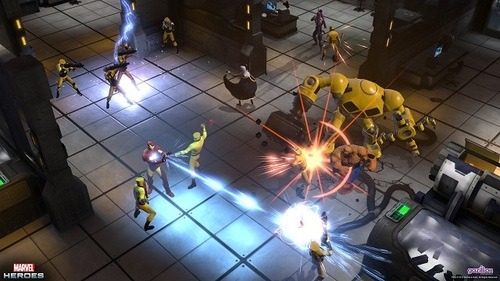 Knowing my penchant for multi player super hero computer games (thanks in large part to the 5 years I spent playing City of Heroes) and all things Marvel, it thought it was going to be a no brainer that I would play the hell out of this game. Plus I was a really big fan of both Marvel Ultimate Alliance 1&2, and given that the game play looked the same except much more expansive, I thought there was no doubt I would enjoy it. Unfortunately, the appeal quickly waned. 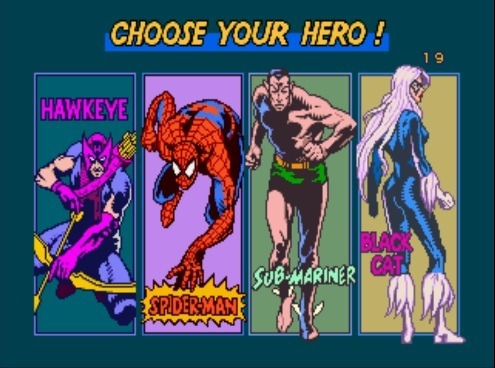 Given it was a pay as you play game with those popular “micro transactions”, You got to pick one of 5 free rotating characters to start with, so I remember picking Captain America who seemed to be the most useful. The game then throws you in with a bunch of other players some of which are playing as the same superheros as you, which is more than a little confusing. But soon I found myself teaming up with a Human Torch, Black Panther, and Nightcrawler, and we were off on on first adventure: stopping a bank heist being perpetrated by Black Cat and a bunch of her goons. I was really surprised that they cast Black Cat as a baddie as although sure she’s skated the line a bit, she is really not someone I would consider a super criminal (although Dan Slott would disagree…stupid Dan Slott). In fact, when she showed up I didn’t start beating on her for at least 30 seconds which is an eternity in computer time, and it really wasn’t until I saw the dude playing Panther start wailing on her that the light bulb clicked. Here I am, used to the old Spider man arcade game where Black Cat was one of the player characters not a thug that needed her hash settled. Can I get sidetracked a bit on the Spider man arcade game, folks? Talk about a criminally under played beat ‘em up. With all the talk about and the rereleases of The X-men, Captain America and Avengers, and TMNT arcade games from the early 90s, it’s a shame this game doesn’t get more dap. It’s got crisp visuals, interesting level design with it changing from a beat ’em up to a side scroller often, and flat out strong representation of some of Spider man’s greatest baddies or as some would call the “best rogues gallery any superhero has outside Batman”. I will admit it’s got a pretty piss poor line up of heroes though outside Spidey and the Black Cat. I mean some would argue Namor is a pretty important Marvel character, and I’m not saying he isn’t. But he’s not exactly known as being a first tier ally of the wall crawler. Not even second tier really. I mean the only time I can remember them teaming up with any sort of significance was in the classic Spider-man and his Amazing Friends episode “7 Little Superheroes” (which by the way is my all time favorite episode of that show). Still, at least he doesn’t appear as as a character in any other Marvel fighting game from that era so his inclusion here is an original choice. But really, the last selection of Hawkeye is just plain wrong. Hawkeye has nothing whatsoever to do with Spiderman in anyway shape or form. This isn’t Spidey’s team up with the West Coast Avengers, people. If that were the case, why not give us Mockingbird or Tigra instead of The Submariner? It makes no sense. Plus since Hawkeye already appears as a playable character in Data East’s Captain America and the Avengers game and rightfully so, his inclusion in this game just reeks of Sega being both unoriginal and uninspired. Sure, I get that Sega’s bread and butter is ripping off concepts from other games and putting their own spin on it (like Congo Bongo and Donkey Kong), but this is just lazy. I shutter when I think of what they could have done with this game if Sega had given two shits about it. Like why not, oh I don’t know, DAREDEVIL, as a playable character. Surely Old Horn Head is a much more Spidey centric character than the our favorite purple archer. Or The Human Torch would be an excellent candidate given his history with Mr. Parker. Or damn…speaking of the well known cartoon…what about Iceman? or Firestar? All much more worthy entries to a game that craps the bed when it comes to this important detail. Oh well…where was I? Oh yes, Marvel Heroes…right right. After defeating the Black Cat, I was treated with more random superhero swag than I knew what to do with, evidently to equip on my character, which I never did because again I had no concept of what was decent or not. And then I was thrown back to Avengers Tower or wheresoever the hub was again, filled with tons of other Captain Americas all running around. That’s about when my suspension of disbelief with this game came to an end. Because although I realize the appeal of a game like this is to play as one of your favorite Marvel characters, but when you realize your selection is not unique, and you are just one of hundreds of the same character running around, it has a way of marginalizing your choice. Like instead of being something truly super-heroic, you are reminded that you are just one of the countless unwashed masses. And that’s not the kind of escapism I need or want from a game. As I said I played City of Heroes, and sure there were characters that looked like mine, or clones, or rip offs of famous comic heroes, but at the end of the day, my character was one of a kind and that made me feel invested so much more in his development.